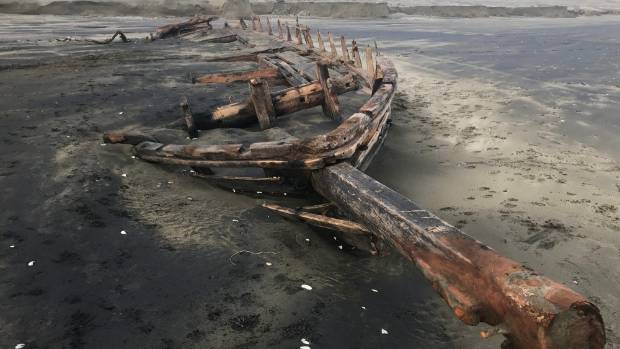 A 17m long schooner has been uncovered at the northern end of Muriwai Beach following a big swell event late last week and reasonably large tides early this week. As impressive as this erosion is and what it has uncovered, the point many of us wouldn't think about is the amount of sand that must have deposited here to cover the whole thing up. Those of us familiar with the NZ's northern west coast might be less surprised by this. NZ's west coast is one of the highest energy coasts in the world, regularly receiving large swell from strong low pressure systems that circulate across the Southern Ocean. The stretch of coast from Taranaki north is characterised by wide dissipative beaches with sand supplied from eroding cliffs, rivers and streams that empty the North Island Volcanic Plateau. This is thought to result in large pulses of sand that travel up the coast delivering sediment to the many vast stretches of beach and the bar features associated with harbours such as the Manukau and Kaipara. This can lead to periods of extreme accretion and erosion along the coast with one of the best examples being the piece of shoreline between Whatipū and Karekare beaches west of Auckland. Roughly 100 years ago there was a rail line running across the base of a cliff that was regularly attacked by waves. This same piece of coast now sits behind a series of wetlands and dunes that extend out more than a kilometer in places. This can lead to an array of unique management challenges which in reality may not be able to be addressed by more traditional means. One such example Sam Morgan was involved with was the retreat of infrastructure from the southern end of Muriwai Beach after an erosion phase of roughly 40-50 years. On the other end of the spectrum are the issues that arise from accretion at Piha Beach (10-15 km south of Muriwai) which has seen between 700,000 to 1 million cubic meters of sand deposited on the beach over the same time frame. This accretion has lead to dune management issues as the sand encroaching into carpark areas and blocking views for groups such as the Surf Life Saving Clubs. This has also resulted in small changes within the beach system such as the impoundment of lagoons and modifying stream direction, which lead to erosion threatening roading assets. Dealing with these issues requires bespoke management approaches, and in the case of Piha, you can read more about how we dealt with it here.